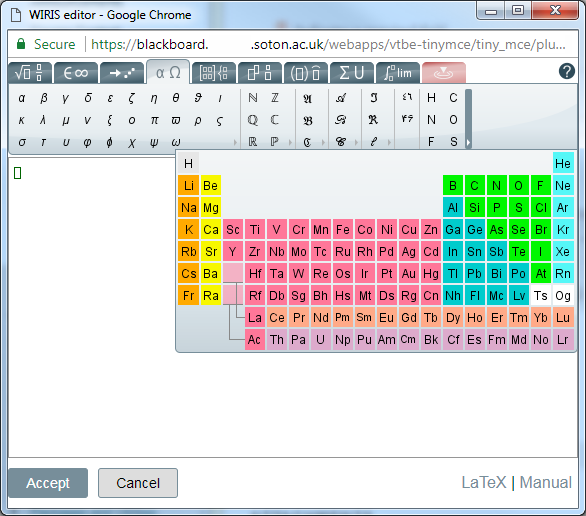 Blackboard features a What You See Is What You Get (WYSIWYG) editor. This allows you to format text that you enter into Blackboard textboxes in a similar way as you would format a Microsoft Word document. You can find detailed instructions on using each aspect of the text editor on the Blackboard web site. The text editor also supports keyboard shortcuts, so that power-users may work faster within Blackboard. RIGHT ARROW Move one character to the right. LEFT ARROW Move one character to the left. DOWN ARROW Move down one line. UP ARROW Move up one line. MAC: CMD+RIGhT ARROW Move right one word. MAC: CMD+LEFT ARROW Move left one word. END Move to the end of the line. HOME Move to the start of the line. MAC: CMD+DOWN ARROW Move down one paragraph. MAC: CMD+UP ARROW Move up one paragraph. PAGE DOWN Move down one page. PAGE UP Move up one page. MAC: CMD+HOME Move to the beginning of the text. MAC: CMD+END Move to the end of the text. SHIFT+RIGHT ARROW Extend the selection one character to the right. SHIFT+LEFT ARROW Extend the selection one character to the left. MAC: CMD+SHIFT+RIGHT ARROW Extend the selection right one word. MAC: CMD+SHIFT+LEFT ARROW Extend the selection left one word. SHIFT+UP ARROW Extend the selection up one line. SHIFT+DOWN ARROW Extend the selection down one line. SHIFT+END Extend the selection to the end of the current line. SHIFT+HOME Extend the selection to the start of the current line. SHIFT+PAGE DOWN Extend the selection down one page. SHIFT+PAGE UP Extend the selection up one page. CTRL+SHIFT+END Extend the selection to the end of the document. MAC: CMD+SHIFT+HOME Extend the selection to the beginning of the document. MAC: CMD+A Select all elements in the document. BACKSPACE Delete the selection. Or, if you make no selection, delete the character to the left of the mouse pointer. MAC: CMD+BACKSPACE Delete all of a word to the left of the mouse pointer. MAC: CMD+C Copy the selection. MAC: CMD+V Paste cut contents or copied contents. MAC: CMD+X Cut the selection. INSERT Toggle between inserting and overwriting text. MAC: CMD+Z Undo the most recent formatting command. MAC: CMD+Y Redo the most recent undone command. SHIFT+F10 Display the contextual menu. This is the same as a right-click. MAC: CMD+B Select or clear bold formatting. MAC: CMD+I Select or clear italic formatting. MAC: CMD+U Select or clear underlining. 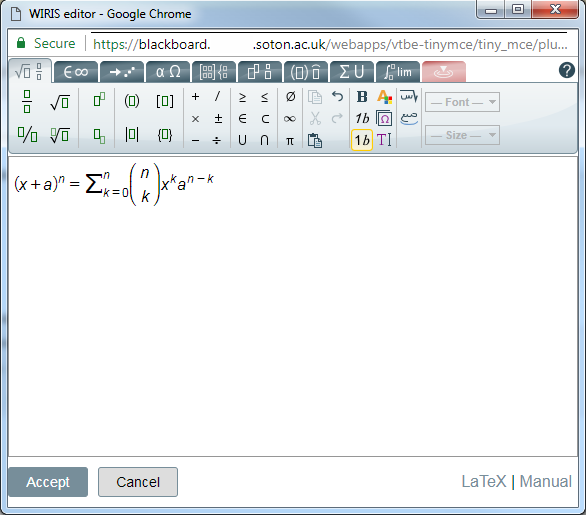 The maths editor is available via icon 43 in the above list. Further information about the Math Editor is available on the Wiris web site. A list of the icons is also available. Greek, letters, and numbers tab includes a periodic table. Other symbols can be found in the arrows tab. See this page on the Wiris web site for an overview. This animation below shows a simple example of usage.